United States of Russia (USR) in alliance with United Kingdom of Russia (UKR) has a fierce fighting against Nationalistic Fascistia which treacherously attacked our peaceful land. You can take the campaign and help overcome the treacherous and cruel enemy. Also you can arrange a competition with your friend and play the game together at the same time on the same device. Confrontation between the two groups of tanks on the front line. 2D-game top view on the battlefield. The gameplay is a bit like the game Worms. 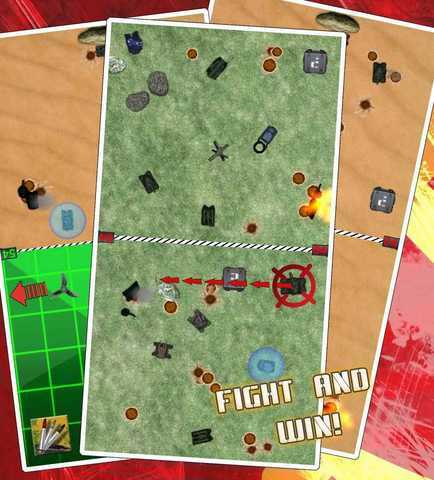 Features: play the game together at the same time on the same device in the duel mode, 8 types of military equipment (battle tank, heavy tank, missile tank, electric tank, dark tank), 9 types of weapons (standart cannon, heavy cannon, electric blast cannon, electric chain cannon, missile cannon), different area of battle. You can play this game alone or together with your friend, father and son, grandfather and grandson.